After three years the Norwegian concordat was contested and eventually replaced by a royal decree. Then, during the Reformation of the16th century, the Evangelical Lutheran Church replaced the Catholic one. They have a tradition of "belonging but not believing", many using the church principally for baptisms, marriages and funerals — and also for confirmation ceremonies. 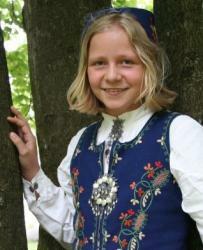 Norwegian girls look forward to their traditional confirmation gift — a beautiful folk costume. And with the large sums of money they receive, some boys can even buy motorscooters. In 2012 Norway "disestablished" its Lutheran state church, which turned the "state church" into the "folk church". About all this seems to mean is that half of the MPs no longer have to be members of the Lutheran Church and the king no longer officially appoints its bishops, though he is still required to be a member. The Lutheran Church also retains its financial privileges. The state keeps on paying the salaries of its clergy, their pensions and the upkeep of its churches. In spite of this, the Lutheran Church charges for entry to its historic cathedral in Trondheim. The Bishop's reaction was to call it "rubbish", and to punish Church employees suspected of being whistleblowers, which the Church called being "disloyal". Rome canonised the Viking king Olav for forcibly converting his countrymen to Catholicism. He thought the new religion would strengthen his position, but his successors found themselves taking orders from a distant pope who bound them with a concordat. King Magnus VI, known as "the Law-Mender", issued the first Western secular law code. However, just three years later he was forced by the concordat to hand over to the Church jurisdiction over anything that it considered to fall within its sphere. The list of these "Church matters" in article 2 of this summary shows how the concordat put people back under its laws and its courts. As the concordat's introduction makes clear, this was a settlement between the Archbishop and the King made quietly, with no endorsement by parliament. The Vatican treaty overturned traditional law by giving the Church vast new powers over the people. Doubtless for the sake of the ailing king, the concordat is depicted as a way to help its signatories achieve "salvation for their souls".